The Society would like to recognize and reward the performance accomplishments and abilities of Cleveland Bay pure and part-bred sires and dams. This award not only takes into account the performance abilities of the stallion and mare but dually provides these horses additional recognition achievements of their progeny. 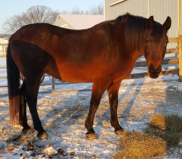 PA programs not only recognize the talents and efforts of Cleveland Bays out there performing but can also serve as an aide to both breeders and buyers to discover which CB lines are active, successful and excel in different disciplines. See the 2017 Program Rules for this award at the bottom of this page. 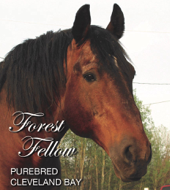 The Society would like to recognize and reward the performance accomplishments and abilities of Cleveland Bay pure and partbred/sport horses sires and dams. PA programs not only recognize the talents and efforts of Cleveland Bays out there performing but can also serve as an aide to both breeders and buyers to discover which CB lines are active, successful and excel in different disciplines. How it works: Sires and dams will earn points throughout the PA year not only for themselves, but each of their progeny enrolled in the PA program. The sire or dam need not be enrolled in the PA program to be considered and accumulate points for this award. Points will count for EACH progeny enrolled in the program. 4 points for a horse that has returned a PA book and has an offspring in the program that has returned a PA book. Deceased sires and dams are eligible as their progeny is part of their legacy. Sire or Dam need not be licensed by any organization. Sire and dam must be registered in accordance with CBHSNA policy. Points are allocated to the horse (not the owner). No prize is awarded. At this time this is an award and accolade in name and title only to demonstrate the Cleveland Bay is a performance breed. Annual winners will be kept on record. Past and present owners of winners will be encouraged to submit material for a feature spread/article in the BayWatch and year end printed issue of The Chronicle of the Cleveland Bay Horse in North America. In cases of a tie, the winner will be determined by the number of progeny that return a log book with eligible scores to the Administrator. Stallions and Mares in the program accruing points in 2018. Congratulations to the Sire and Dam Award winners. This is the third year both sire and dam information is published for horses participating in all CBHSNA awards and recognition programs. Many organizations like U.S. Dressage Federation and U.S. Eventing Association maintain records and report pedigrees of competition winners during the year. It gauges trends, and it gives breeders, owners, and buyers an opportunity to see what bloodlines are in the competition world. It is not an exact science as with our report is based on CBHSNA membership and who choose to enroll in Society programs. There are many CBs excelling in many disciplines competitive and non competitive all over the world, but this is the only program which attempts to track performance. It might help breeders and particularly stallion owners to promote their stock not only within the CB world but to the entire equestrian world. All participants in the 2018 program competed not only in CB breed classes but most were in open competition against all breeds. That is important as if the breed is to survive and thrive we must be seen and succeed in open competition. Many familiar names on the list this year with some new names. Spread the news of the variety of sires and dams competing throughout North America.